Transparency Market Research states that the competitive landscape of the global oleate esters market is expected to remain in a state of high intensity over the coming years, owing to the high profile rivalries between the leading players. Procter & Gamble, Wilmar International Ltd., and Croda International Plc., have been the leaders of the global oleate esters market till 2015. Most of the prominent players in the market are making consistent efforts when it comes to improving their profitability through the improvement of production capacities. The shape of the global oleate esters market over the coming years is expected to change due to a shift in the focus of these companies towards strategic partnerships. As written in the recent research publication released by TMR, the global oleate esters market which offered was valued at US$1.4 bn in 2015. The market is projected to expand at a positive CAGR of 4.80% from 2016 to 2024 and is expected to reach US$2.2 bn by the end of 2024. In terms of volume, the global oleate esters market is likely to rise at a CAGR of 4.10% for the same forecast period. The demand for ethyl oleate has so far been the dominant factor in the global oleate esters market, which is attributed to the high usage of ethyl oleate in applications such as lubrication. The ethyl oleate segment is expected to continue progressing at a CAGR of 5.10% between 2016 and 2024. North America and Asia Pacific are currently registering a high rate of growth from the global oleate esters market, a fact attributed to the presence of numerous large scale production facilities. The increasing number of industries using oleate esters is also adding to the growth of this market in these regions. Asia Pacific took up close to 33% of the global oleate esters market in 2015, becoming its leading contributor. This region’s growth rate is largely reinforced by the high availability of oleate ester raw materials, along with a well-established chain of production by some of the leading players in the market. 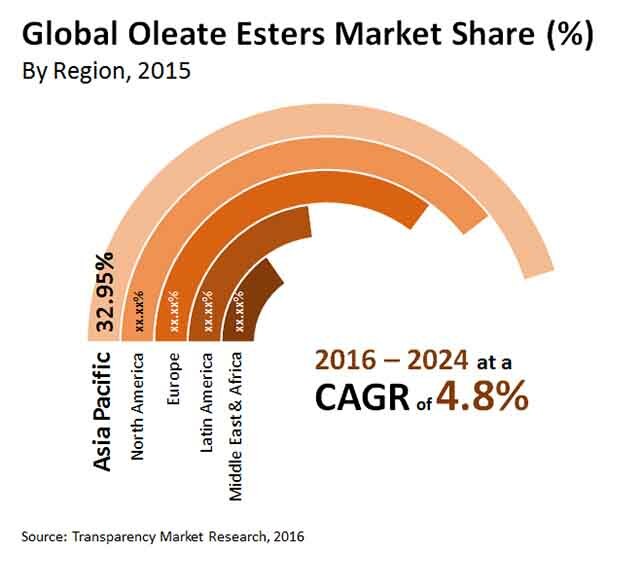 The oleate esters market in Asia Pacific is also bolstered by the continual rise in research and development activities. In oleate ester market in North America is expected to continue its growth rate through the growing consumption of personal care products. However, the high cost of oleate esters continues to hamper the full potential that the global oleate esters market can achieve. Players in the market continue to look towards emerging economies for striking new grounds of profitability.